Above is a photo that I shot some time ago. 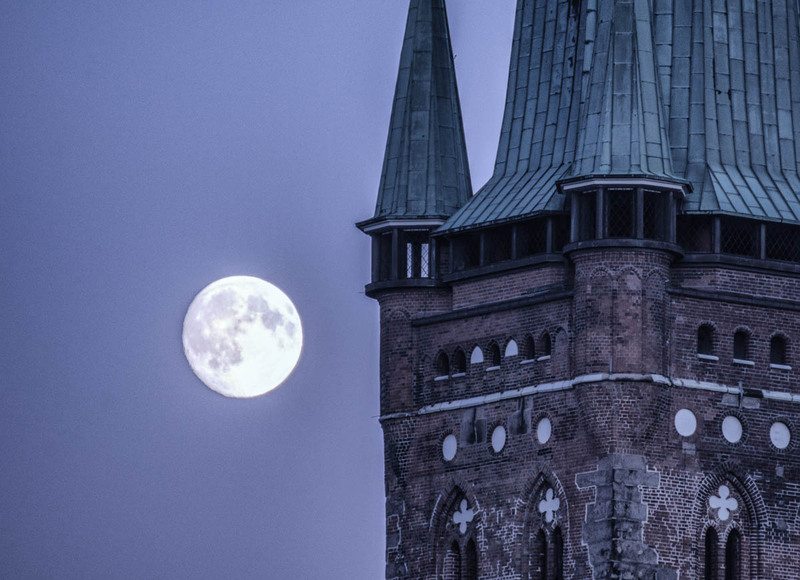 I saw the moon beside the St. Petri Church in Lübeck and liked the scene. What I noticed or learned is that sometimes the moon will appear much bigger if there is an object in the foreground. I think same counts if the moon is near the horizon and if I am not wrong it’s called Moon Illusion. I believe lens compression helps too if you shoot with a Tele lens. I shot the photo with my Tamron 70-300mm lens. I have an old post from 2013 where you can see the whole church tower beside our Holsten Gate. I didn’t know that trick about making the moon seem larger. Not many tall buildings around here but maybe it would work with trees? Weeks later and by accident, I saw a moon photo on social media with a hill and castle in the foreground if I remember right. There was a discussion where people talked about tele lens compression and the Moon illussion. So, I think these two factors are at play. Pretty interesting. This almost seem like a photoshopped/Animated picture! In a good way 🙂 Beautiful. Haha, cool 🙂 In a way it’s a bit photoshopped… but not the moon size. I shot the photo in the evening but somehow a blue tone was missing to make it look like a night shot. So, I added a bit more blue tone to the image. Apart from that I cropped the image a bit.